In addition to dental school, endodontists receive two or more years of advanced education in this kind of treatment. They study root canal techniques and procedures in greater depth, for diagnosis and treatment of more difficult cases. In Canada to gain the title of a "Certified Specialist in Endodontics" it is required to complete the requirements of the Royal College of Dentists of Canada which includes graduation from an accredited specialty program as well as completion of a rigorous board exam process. As endodontic therapy or root canal treatment can be very complicated, many dentists choose to refer their patients to endodontists due to their advanced training and knowledge, as they are often more capable of managing such complicated cases with a better long term outcome. What Happens During Endodontic Treatment? What exactly is a Root Canal? Each of your teeth has one or more "canals" which contain a blood supply and nerves. These are incased in the root of your tooth. This tissue inside the canal is referred to as the pulp. The pulp functions to help the tooth develop, nourish the tooth, protect the tooth, and warns us to insults which maybe potentially dangerous to the tooth (extreme temperatures, cavities, and trauma). 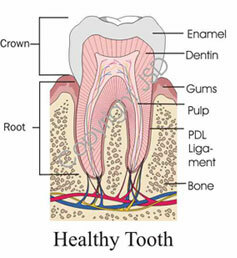 When the pulp becomes injured and cannot heal itself, the pulp starts to degenerate and the tooth becomes diseased. Mostly commonly, bacteria from your mouth and cavity infect the pulp and cause the disease. Most often, your tooth becomes painful and/or abscessed. So your tooth is "infected" and requires treatment to keep the tooth. 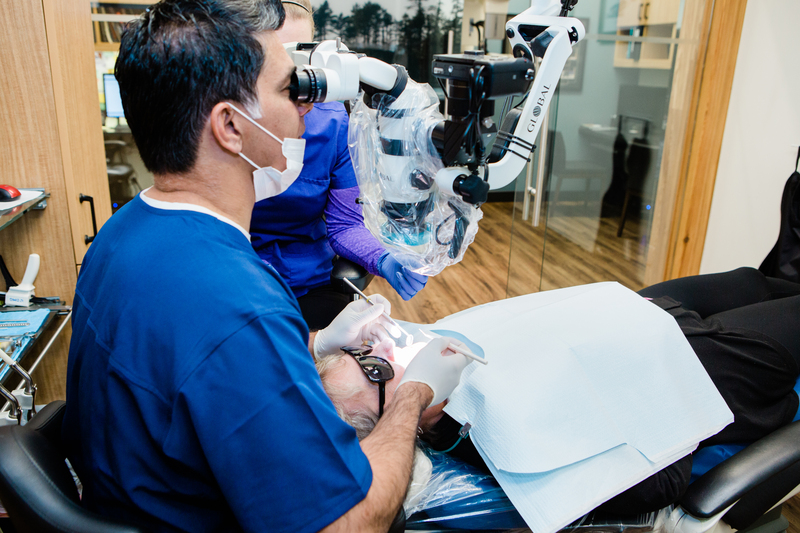 The goal of endodontic treatment or root canal treatment is to remove the infection from inside your tooth so that your tooth can return to normal and you can function with it. Once your tooth has been diagnosed that it requires endodontic treatment and is there is enough tooth structure remaining to keep the tooth functional, treatment can be started. A local anesthetic will be given. A sheet of latex called the "rubber dam" (we've got non-latex ones too) will be placed around the tooth to isolate it, hence keeping it clean and dry during treatment. 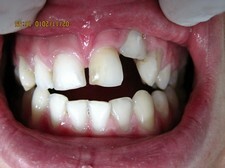 The tooth is cleaned and any defective fillings and decay are removed. At this time we make sure there is enough tooth remaing and that your tooth is worth keeping. Then the canals are located. The number of canals will vary from 1 to sometimes even 6, depending on the tooth. The contents of the canals are removed and they are disinfected. The canals are then sealed with a cement and a rubber like filling material called gutta percha. At this point the root canal treatment is complete but we need to place permanent filling to seal the canals and to restore the lost tooth structure so that your tooth can function normally. If you were missing a great deal of tooth structure, your dentist will often recommend that a crown be placed to help strengthen and protect your tooth. The number of visits will depend on your particular case. Some treatments take 2 visits but many are just a single visit. Occasionally 3 appointments are needed. In any case, it depends on the degree of infection/inflammation and degree of treatment difficulty. By spending the time to carefully treat your tooth in the best way possible, whether it be 1 or several visits, I can ensure you that I will give your tooth the best chance of surviving as long as possible, without any pain or discomfort. 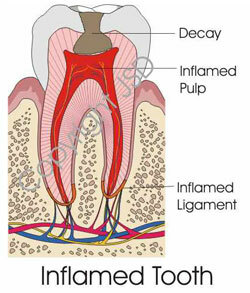 Pain that originates from the oral cavity and surrounding areas can be very complex. Often it is difficult to localize the source of the pain and this is due to the vast network of nerves in the mouth. Pain can be "referred" which means it may originate in one place but you will feel the pain in a totally different part of your mouth. Therefore, it is very important to correctly identify the source of the pain so that the right tooth is treated, otherwise the pain may persist. There are times when we determine that the tooth is not the source of the pain and a root canal treatment is not even required. The origin of the pain may be related to the sinus, muscles, TMJ, or disorders of the nerves. It is crucial that these are diagnosed correctly and treated in the correct manner. In these cases a referral to another specialist, such as a Facial Pain Specialist, Oral Surgeon or ENT physician may be required. An endodontist has advanced training and experience in diagnosing these types of complex pain and providing the right treatment to help get you pain free. Traumatic dental injuries can happen in many ways: sporting activities, the playground, motor vehicle accidents. Quite often the tooth fractures or is even knocked right out of the mouth. These kinds of injuries can cause damage to the pulp and root canal treatment may be required. However, management of these kinds of injuries may be very complicated and require specialized knowledge/training. Often time is of essence and traumatized need to managed very soon after the injury or the chance of survival drops drastically. Traumatized teeth can cause problems even many years later and it is important to have these teeth checked regularly. The endodontist specializes in treating traumatic dental injuries and will be able to give the injured tooth the best chance of surviving. Dr. Parhar has extensive trauma experience as he has been involved with many sporting teams over the years and has managed a great number of complicated cases. Occasionally a tooth that has undergone endodontic treatment fails to heal, or pain continues despite the previous treatment. Although rare, sometimes a tooth initially responds to root canal therapy but becomes painful or diseased months or years later. When either of these situations occur, the tooth often can be maintained with a second endodontic treatment.